Fiber Flux: Red Heart Mixology Giveaway + Review! Red Heart Mixology Giveaway + Review! Have you tried Mixology by Red Heart Yarns yet? Mixology is a fabulous new yarn collection that includes 3 different types: solids, swirl, and prints. It takes the guesswork out of choosing and mixing colors...all yarn in the collection is the same weight and recommends the same hook/needles. Below is an informational video I made to learn more, check it out! A special thank you to the good folks at Red Heart for sponsoring this giveaway!! 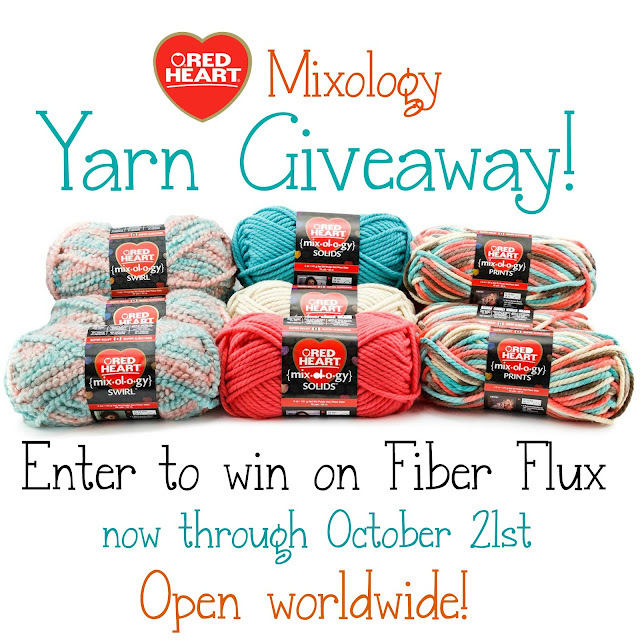 Giveaway is going on NOW through October 21st. Must be 18 or older to enter. Open worldwide! Prize package will be shipped from Red Heart. Now go, go, go and enter!!! I love the Calypso Print. I would probably make a blanket. This yarn sounds great. I would make hats and/or cowls in the color green which is my favorite color. Great competition, I'd love to try this! And thank you so much for having it open for international people! Party pink is my fav!!! What beautiful yarn! I LOVE the basis greens I'm seeing and also the variegated combinations, too. (I'm having a hard time picking ONE favorite color!) I think this would make a fantastic, warm throw for a sofa or chair and, of course, cuddly scarfs, too. I just saw this new line in my catalog yesterday! Awesome!!!! Ooops....forgot to answer both questions. Pinks and Purples are the colors I gravitate towards. I would probably make a crochet lapghan. I would love to win this yarn. The color combinations would make beautiful scarves. I would make a scarf and hat, or a baby blanket with the yarn. My favorite colors are pink and blue. Love how this yarn takes the guess work out of coordinating colours! I would make scarves with Mixology and anything Purple! I would love to make a beautiful scarf with that yarn. Red is my favorite color. Love, love, love this yarn! I see some awesome hats! I will make lots of cute hats for my baby girl...after 9 years and three boys God granted me a precious little girl!! I learn to crochet just at 4 months into pregnacy. I have done so many things through my pregnacy and to learn crochet have been a therapy to occupy my mind since i lost a child of mine just after one month of giving birth. Its been a really hard time for me to deal with my emotions but crocheting ease my mind. Also God have given me a lot of strenght but i can tell you is like almost therapeutic to do crochet to sooth your emotions!!! Such pretty yarns! Would love to win them. Very pretty yarns. Would love to win! Thank you for the opportunity to win. I would love to make a infinity scarf with this yarn. I think it would work up so beautifully. My favorite color is orange. Perfect for this time of year! Love earth toned colors. They are so neutral and make beautiful afghans. If I won this, I would make a blanket for my coworker who is getting chemo treatments. I think it would brighten her day. I don't have a favorite color, but I tend to buy a lot of green & purple. I love the color calypso. I'd probably make a blanket for baby. Thank you for this giveaway, hope I win! Love your blog and tutorials. Thanks for having this great giveaway! I've been wanton to try Mixology. I love the mixology blue and pink. I would make a nice squishy mermaids tail blanket. My favorite color is all types of blue. I would make hats and scarves for my family! mixology looks like a nice thick yarn with which I would make warm things like hats, scarves, and blankets. My favorite colors are blues and purples. Is so beautiful yarn! perfect for a coloring winter. Oh what would I make, maybe a nice warm Afghan blanket, I need a blanket. It might not be enough though, so I might make something for my grandson, or make a sweater for me! Love the blue suede! Great color combos. Thanks for sharing. This yarn looks awesome. I like the Retro print and swirl. Would add the coral solid and make a retro afghan! I would make a scarf. I like the calypso print, beautiful colors! I love the blue and greens as well as the grey and whites. I would probably make some lovely cowls out of these!!! oh that yarn is totaly going to be a christmas present for a new baby blankie! I would make a fun Throw for the Grangirlie!!! Colors match her perfectly! :) I love any shade of watery Blue! Any color I just enjoy colors blues are a favorite. I see a matching scarf, hat and fingerless mitts. Maybe pinks for a new Hope scarf for Breast Cancer Awareness. Like the coral, would probably make a top. Make something for my girlfriend. I did see the Mixology line last week in fact, I was browsing the internet as always. It looks like a great idea and I'd love to try it, plus I need some nice chunky yarn. I like that they have patterns but I look forward to doing some of my own with this yarn too. I play from France.... It looks fantastic balls... Hope I will win to test it.Have a nice day. *-* I would like to win!!! Awesome colours! I'd make a winter hat, my favourite colour's Turquoise! Fun! These would make some pretty scarves! Thanks for the chance to win. I like the Retro print or Moonlit print and would use it to make blankets for my kids. I really like to crochet blankets and there are so many great colors to choose from!! I love the lavender and grey tones . . . a warm cowl with a hood is what I would make! Darlene P.
Beautiful colors of yarn. Would love to make an afghan out of this. Great colors. I haven't seen this yarn before. Would love to make a baby blanket with it! I like the Renaissance Print, and I don't know what I'd do with it. I would love to make Hat & scarf sets with this yarn! I like Calypso Print. I would make myself a cozy sweater. Hard to pick a favorite. Love the blue suede and the plum. Would make a lapghan with the blue suede - it looks so warm and soft. Love Red Heart! Thanks! I'd love to make cowls with this pretty yarn! The prints are gorgeous and the solids are so vibrant! I'm so excited to try the new Mixology line by Red Heart!! Thank you for offering a giveaway. I have learned so much with your tutorials and videos. My favorite is the Retro Print. I would make shawls for my family for Christmas if I won. What a great giveaway! :) Beautiful colors! I really love the Orchid color, but also Calypso, Party and Jade. Baby blanket with plum and party print!!! I love the retro colors. I would make a thick cowl, which the pattern is on the Red Heart site. My favorite color is orange, but I love working with any really bright colors. I would make scarves, mitts, hats cowls., and blankets. I would try anything. The colors are absolutely beautiful. I love the look of this yarn and my favorite is 'Sizzling', just in time for gift-making. Love all of the color combinations! Hoping I win! I love the Party Print! I would love to make an afghan! Blue, purples and greens and a shawl or cowl. I think Calypso is my favorite. I would make a scarf. Wow, great giveaway! I love al green and blues, I would start on gifts. I sure could use this. Thanks for sharing. I would love to try this yarn. My favorite color is the blue suede swirl. I would probably make cowls or infinity scarves, although the possibilities are endless. Wonderful yarn it would be fun to make toys , hats and a scarf. I love the Rennaisance Print,and would love to make an "Outlander" inspired cowl with fingerless gloves! Christmas gifts for my 11 grandkids. The girls love pinks and purples. Christmas gifts got my 11 grandkids, the girls love pinks and purple. Oh, the wonderful things I could make with this beautiful yarn!! So excited! I love giveaways! What a wonderful giveaway! I love how the yarns are colour coordinated. I'm particularly drawn to the Blue Suede colourway and would probably make a blanket. I would make this hat for my granddaughter. I love the pink and multicolored yarn. I would make Christmas gifts. I love any shade of green! Wonderful colors, I love all of them. Scarves, afghans and cowls would be on my to do list. Thanks for the giveaway! Purples and a blanket for my sister!!! I love the Swirl colors and would make scarves and mittens for gifts. I see crocheted shawls ponchos and scarves in my future in this inspiring yarn! I'm excited to find patterns that will make the most of it! Very cute colors!! I would love a chance to use this yarn!! Good luck everyone!!! I would make a nice afghan with this yarn. My favorite color is blue. pink is my fave colour. I like solids the best, pink. I could make a really warm cowl for breast cancer awareness! Love these 'mixed' type yarns- really gives a different feel to projects! Thanks for the giveaway! My favorite color is the Mixology Swirl Retro (salmonish-greenish) I would make some lovely scarves with this color! These colors are so beautiful I love the pinks and blues!! I would make an afghan. What a great giveaway! Thanks!! Thanks for the video and the chance to win. I like the jade! All these colors look beautiful together, and I'd probably crochet a blanket. Thank you for the opportunity! oh my fav color is purples!! Scarves and matching hats as Christmas gifts. I think I might make slippers with the yarn. I like the purples and the pink yarns. I would most probably make hat, scarf and gloves with the blue suede yarn to match a coat I just bought today. SO impressed with yarn ! thank you for this giveaway ;-). I would make an awesome blanket for sure! I want to make a blanket in the Retro scheme. I love the Retro Print! I would crochet a ripple blanket. I prefer neutral colors! A blanket for my step daughter! looks like a fun yarn!! Amazing color combinations! Looks like a dream to work with! Can't wait to try it. Thank you! I love your video too. I would make a throw for my aunt. Those colors totally compliment her living room. I would probably make a cowl or maybe a lapghan out of the pink, coral and orchid! Fun yarn. I think I would try a fun blanket. What fabulous colors! I would love to make a scarf and gloves with this. I love Calypso and would make a blanket. The colors are all so pretty I couldn't choose just one I liked the best. I would make something for my daughters with it. So very pretty! Love to use those turquoise colours and make a cozy blanket. So many patterns would really shine using these mixology line. I'd probably make an afghan. I like both retro colors. Love reds and bronze colors for the fall. Blue Suede and Calypso are my favorites. I would make a cushy blanket for my baby girl!!!! I would like to make something fun for my son. I'd take it all in Calipso print and make me a new snuggly throw for tv watching/book reading/granddaughter snuggling time. My favorite color is purple, but I do like the blues too. I'd love to make an afghan with this! I would love to try Mixology by Red Heart Yarns ...especially the prints!!! I love blues. Calypso is great. I would make an afghan. warm squishy slippers is what I would make with this yarn. My favorite color is Magenta so really anything pink/purple, but when it comes to yarn I love bright vibrant colors. I like the Calypso and Party prints and the matching colors. That would make fun blankets. I'm thinking slippers for all my girl's, I have an old pattern that uses bulky yarn. The retro color looks pretty or anything turquoise and coral! I would make a scarf and glove set. I really don't have a favorite color. I love Red Heart. I love the wide variety of Red Heart yarns. I like the Retro, and would most likely make something for my Grand Kids. Blue suede is my favorite. I would make a cowl. So many pretty colors I can't make up my mind. Would make a beautiful lapghan. I like blue. I want to make a scarf and mittens. I love the Blue Suede and Calypso. I think this would make such a warm poncho! Looks like awesome yarn, I think I would make a beautiful cowl with it first, or a baby cocoon or afghan. Oh who knows the options are endless, and the colors beautiful, I think I would like to try Party in the swirls. I love the blues and pinks together. Thanks for the opportunity to win some yarn. Love all the colours, plum is gorgeous, and the calypso in the swirls. I would make a blanket for my daughter for her room as she loves soft and snuggly blankets. Love this concept. Can't wait to find locally to try out. I would make a tulip crocheted throw.My favorite color is teal. I would make my first blanket! Oh, decisions, decisions! A cowl for me, a baby gift, or something for my kids????? I love all of the color choices....I guess it depends on what I decide to make! I would make an afghan. Such lovely colors!! I would makes myself an afghan. I have never made myself anything. My favorite colors are purples and gray.